French ambassador says "Partnership with Jordan reflects confidence in the Kingdom"
AMMONNEWS - French Ambassador to Jordan David Bertolotti Sunday voiced his country's commitment to supporting Jordan during the troubled times the Middle East is living through. 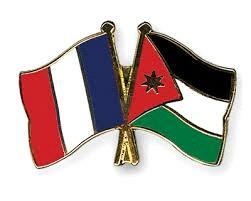 "Jordan-France partnership is based on several human bonds", the envoy told a ceremony hosted by the French embassy in Amman on the occasion of France National Day. He pointed out the increasing numbers of French tourists, businesspeople and experts who visit the Kingdom. Moreover, Bertolotti said the partnership linking both countries demonstrates our confidence in Jordan' and its people, commending what the Kingdom has achieved in terms of the political and socio-economic reforms. He also stressed the embassy's eagerness to reach out to Jordanians to propose projects in a bid to improve people's lives. The ambassador also spoke of the Palestinian-Israeli conflict which he described as a major source of instability, stressing that Paris and Amman work together to realize peace. He also noted the grave risks of the unilateral withdrawal of the USA from the Joint Comprehensive Plan of Action known commonly as the Iran nuclear deal.